One challenge when writing a blog is how to engage the reader- an even greater concern when writing about science. It is difficult to effectively write a science blog that is understandable and compelling without diminishing the exactness of the science you are trying to present. I perused several climate blogs, and enjoyed this effective example from Yale Environment 360 published by the Yale School of Forestry and Environmental Studies. 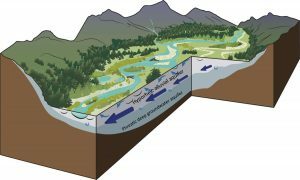 This article tackles an explanation of river system dynamics in an interesting and pertinent way. There are several strategies I want to highlight. Comparisons: To explain the idea of ecosystem resistance, the article makes a comparison to “immune systems”. This concept is understood by the majority of people and creates a distinct image of this scientific interaction. Comparisons are used effectively throughout the article. Jargon: This article does a great job of explaining terms using text and/or images before introducing necessary jargon. This strategy is key to prevent turning away readers who might not be familiar with the scientific terminology. Relevance: Amidst scientific information, this article conveys the relevance of river systems and why it is important to spend time understanding what is happening to them.